What would happen after a Nuclear EMP attack? The scenario begins with a nuclear explosion in low earth orbit, at the distance of the International Space Station, above middle America. A nuclear blast about 200 miles above the mid-U.S. could wipe out every electric grid in the country-plunging our nation into darkness. It would literally send our nation back to the 18th century. (A very powerful X-class solar flare could have the same impact.) An EMP blast from a nuclear bomb would shut down devices or vehicles using microchips. Planes would stop flying; banks and hospitals would cease operation; trains would stop running; tractors, trucks and cars would cease working. Elevators would malfunction; subways would stop. All commerce would cease. A blast like this could not only wipe out the electric grid in the U.S. but in Canada and Mexico. The more technologically advanced a nation is, the more vulnerable it is to an EMP attack. Five container ships in the gulf of Mexico fire medium range SCUD missiles high into the atmosphere until they reach far above Kansas and other states. On board are 45KT nuclear warhead. It explodes creating EMP that takes out all of the integrated circuits in the United States. Local agencies really don’t know what’s going on since there is no communication. No cell phones. No radio. No land lines. The grid is gone. There are spare parts but nowhere near enough to fix it all and because of the nature of the electrical grid, all the holes have to be plugged for the juice to flow again. And even if they had enough parts, how do they transport them? No trucks. No cars. By now, most people in the subs have run out of food they would normally remotely consider eating. Looting at the local Wal-Mart and grocery stores begins as people simply take what they need. If you live in the suburbs, take a close look around. How would the police reasonably patrol your city without cars? Meanwhile, people in nursing homes have started dying en-masse. Without refrigeration drugs quickly go bad. Anyone requiring help breathing or anything else has already died. By contrast, Europe is doing okay. Not great. But okay. Their economies are in ruins but they’re not going to die en-masse. 8% of the population was over 70. Nearly all of them have died. The grid is re-established in the mid-west, the east coast, and much of the south. It’s partially re-established on the west coast thanks to help from South Korea, China, and Japan. Thanks guys. We appreciate it even if most of us are dead. Is what I describe realistic? Nobody really knows. There are studies out there. The book, One Second After is a bit more dire than I think it would be. And it may turn out that our infrastructure is tougher than it seems or that the types of nuclear warheads that an Iran or North Korea could produce aren’t powerful enough to cause the necessary EMP. Do I think this will happen? Probably not. I have a lot of faith in humanity. But when one considers the things that we worry about – global warming comes to mind, it amazes me how unconcerned people are at how easily disrupted our modern lives could be given how dependent we are on our technology today. For many people, their first concern regarding an EMP attack or a solar super storm is the protection of their personal electronics, or even their automobiles. For nearly everyone, though, the first real problem they will face will come from the loss of power to the pumps that supply their water and with the computers that maintain the only local food supplies. Although most individuals cannot do anything to protect critical computers or to protect the power to critical water pumps, some advanced planning can increase the chances that you will have an adequate supply of food and water. For any emergency food supplies that you do get, it is important to get food that you personally like and are actually likely to use, even if a personal emergency never happens. Then, if an emergency does happen, it will be you, not distant relief workers, who will determine what the content of your food supply is. Some people keep only grains as an emergency food supply. Although some raw grains have a very long shelf life and a high calorie density, they do not have an adequate spectrum of nutrients for long-term use. In any emergency situation where scarcity of food is a long-term problem, we are likely to see the return of long-forgotten nutritional diseases such as scurvy and various kinds of other vitamin deficiencies, especially of the B vitamins and vitamin D.
Don’t forget about water. Few people keep an emergency supply of water, in spite of the fact that it is inexpensive and easy to do. Almost every country of the world has a period of days every year where many people in some large area are without drinkable water. In most countries, much of the water is pumped by electric motors. After a major EMP attack or a solar superstorm, electricity for most of those pumps is going to be unavailable for a very long period of time. It would be easy for most cities to have a protected emergency electrical supply in place for critical pumps; but, like most EMP protection activity, although it is easy and could possibly save millions of lives, it is not being done. It is also a good idea to have plenty of fire extinguishers. The immediate aftermath of either a nuclear EMP attack or a large solar superstorm is likely result in a number of fires, along with the elimination of the water necessary to extinguish the fires. Both the E3 component of a nuclear electromagnetic pulse, as well as the DC-like currents induced by a large solar superstorm, are likely to overheat thousands of transformers that are connected to long wires. Although it is the destruction of the very large transformers in the power grid that could keep the power grid from being restored for many years, many smaller transformers, such as those on utility poles, and spread throughout suburban neighborhoods, are at risk of overheating to the point that they cause fires. If you plan to use solar cells or battery power, you will probably want to keep a small inverter under shielding. Inverters that can step up ordinary 12 volt DC power to a few hundred watts of household AC are not terribly expensive. For people who own protected photovoltaic solar cells, a number of DC-powered appliances have recently become available. If you do have access to post-EMP electricity sufficient to run a microwave oven occasionally, that can be a very efficient way of cooking food in many situations. The problem is that most microwave ovens couldn’t be turned on after an EMP event due to the sensitivity of the solid-state control circuitry. The magnetron that generates the heat in a microwave oven would probably survive an EMP just fine. Microwave ovens are heavily shielded, but the sensitive control circuits are outside of the shielding. A few microwave ovens are controlled by a mechanical timer, and these would probably be fully functional after an EMP (assuming that you can occasionally get enough electricity to operate them). You can still find mechanical-timer-controlled microwave ovens occasionally, although they are getting harder to find every year. I bought one about three years ago at K-Mart for $40 for post-EMP use. I have recently seen small microwave ovens with electro-mechanical controls come back onto the market. If you want to store larger items in a faraday cage, you can use copper screen or aluminum screen. Most commercial faraday cages use copper screen, but copper screen is expensive and is difficult for most individuals to obtain. Bright aluminum screen works almost as well, and aluminum screen can be obtained in rolls at many building supply stores such as Home Depot. Don’t worry about the fact that this screen is not a solid material. The size of the tiny ventilation holes in the mesh of ordinary window screen is irrelevant to EMP protection. Aluminum screen can make a very effective electromagnetic shield. Ordinary ferrous (iron-containing) window screen is not a good material for a faraday cage because it is a poor electrical conductor. CD and DVD data (in other words, optical media) is not affected by EMP. Even if your computers are destroyed, if the country’s economy can get re-built after an EMP attack, then new computers can be purchased from other continents. If all the computer data is gone, then recovery is going to be many years later than it would be if the data could just be reloaded from optical media. Computer data runs our modern world. It is a major part of the invisible magic that I mentioned at the top of this page. If you own a small business, that computer data can be especially important. (It is probably not a good idea to use double-sided DVDs, though, since there is the possibility of arcing between layers during electronic attacks. It is best to just use single-sided single-layer media.) For long-term storage of data, archival grade CD-R and DVD-R media are available at a reasonable price from manufacturers such as Verbatim and Memorex. The archival grade media are much more likely to last for many years or decades, and they don’t cost that much more than standard media. Most stores don’t carry archival grade media, but they aren’t that difficult to find. The most difficult part of operating a car after an EMP event (or even a solar superstorm) is likely to be obtaining gasoline. It is very foolish to ever let the level of gasoline in your tank get below half full. In a wide range of emergencies, one of the most valuable things to have is a full tank of gasoline. A solar superstorm will not damage your automobile, but by knocking out the power grid, it can make fuel almost impossible to find. One common question people ask is about grounding the frames of cars. If you have a car parked in a location where there is a very short and direct connection straight down into a high-quality ground, then grounding the frame of a car might help. In most situations, though, attempts to ground the frame of a car are more likely to just make matters worse by providing an accidental antenna for EMP. The safest way to provide a modest amount of EMP protection for a car is to keep it parked inside a metal shed. We’re looking at two different situations. In one situation where the power grid stays up, you might do well in a city of five or ten thousand people. If the power grid goes down, I would not recommend being in a town of more than 500 population. Once you get past about 500 people, the group becomes unmanageable, especially with no radio communications and no phones to think that you can pull together as a community. Once you lose that sense of community, it’s basically every man for himself. I think people will go kind of Mad Max in an absolute worst case with the power grid down. There’s definitely going to be a public health crisis at the very least, if not a situation where the cities become absolutely unlivable very quickly – I’m talking within two weeks. Mr. Rawles points out the potential for “every man for himself” Mad Max scenarios as being likely outcomes in the event of a down grid. Whether you’re in the city or in rural parts of America you will either be the one looking for food and resources because you didn’t prepare, or you will be the one defending against Mad Max with a full belly and a self defense strategy. If we were to have the onset of a collapse in summertime we’d see a public health crisis very quickly. If it were to happen mid-winter we’d actually see more people dying of exposure, dying of the cold, than we would of dying of disease, especially in the Eastern United States and the North East. It doesn’t take too long a period before blankets are insufficient – people don’t have any alternate source of heat they’ll be freezing to death in large numbers. Then what happens in the next spring when everything thaws out? Then you have a really big public health crisis because not only are you worried about human waste – you’re also worried about thousands upon thousands of unburied bodies. We could be in a situation where we literally could see a 90% die-off in the major metropolitan regions. Ninety percent population loss and that’s just based on loss of the power grid alone, not counting the violence of people as food supplies dwindle, going from house to house taking what little is left – fighting over the scraps in effect. A recent report from the Center for Security Policy suggests that Mr. Rawles’ estimation of a 90% die-off is right on target, as previously discussed in, Within One Year 9 Out of 10 Americans Would Be Dead. I highly recommend that if any of your listeners have the opportunity, if they’re self employed or if they can find employment, or if they’re retired, that they move to a lightly populated rural region that’s in a food producing area. In the event of a true worst-case scenario, I refer to it as When the Schumer Hits the Fan, that’s going to be your safest place to be. There, the population loss will be minimal. But otherwise, in a grid down collapse that goes on for more than a year, we literally could see a 90% population loss in the big cities, and a 50% population loss in the suburbs and as much as a 40% loss in non-viable rural areas – I’m talking desert regions or other areas where there’s not a lot of agriculture that goes on. Tactically, a space-based nuclear attack has a lot going for it; the magnetic field of the earth tends to spread out EMP so much that just one 20-MT bomb exploded at an altitude of 200 miles could–in theory–blanket the continental US with the effects of EMP. It’s believed that the electrical surge of the EMP from such an explosion would be strong enough to knock out much of the civilian electrical equipment over the whole country. Certainly this is a lot of “bang for the buck” and it would be foolish to think that a nuclear attack would be launched without taking advantage of the confusion a high-altitude explosion could create. Ditto with its use by terrorists should the technology to get such payloads into space become readily available to smaller countries and groups. But there’s no need for you to go back to the stone age if a nuclear war occurs. It is possible to avoid much of the EMP damage that could be done to electrical equipment–including the computer that brought this article to you–with just a few simple precautions. 1. One mistaken idea is that EMP is like a powerful bolt of lightning. While the two are alike in their end results–burning out electrical equipment with intense electronic surges–EMP is actually more akin to a super-powerful radio wave. Thus, strategies based on using lightning arrestors or lightning-rod grounding techniques are destined to failure in protecting equipment from EMP. 2. 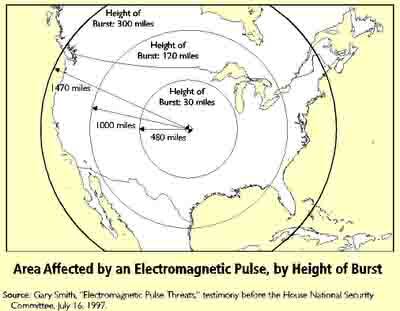 Another false concept is that EMP “out of the blue” will fry your brain and/or body the way lightning strikes do. In the levels created by a nuclear weapon, it would not pose a health hazard to plants, animals, or man PROVIDED it isn’t concentrated. 3. Another “myth” that seems to have grown up with information on EMP is that nearly all cars and trucks would be “knocked out” by EMP. This seems logical, but is one of those cases where “real world” experiments contradict theoretical answers and I’m afraid this is the case with cars and EMP. According to sources working at Oak Ridge National Laboratory, cars have proven to be resistant to EMP in actual tests using nuclear weapons as well as during more recent tests (with newer cars) with the US Military’s EMP simulators. At the other end of the scale of EMP resistance are some really sensitive electrical parts. These include IC circuits, microwave transistors, and Field Effect Transistors (FET’s). If you have electrical equipment with such components, it must be very well protected if it is to survive EMP. One “survival system” for such sensitive equipment is the Faraday box. A Faraday box is simply a metal box designed to divert and soak up the EMP. If the object placed in the box is insulated from the inside surface of the box, it will not be effected by the EMP travelling around the outside metal surface of the box. The Faraday box simple and cheap and often provides more protection to electrical components than “hardening” through circuit designs which can’t be (or haven’t been) adequately tested. Grounding a Faraday box is NOT necessary and in some cases actually may be less than ideal. While EMP and lightning aren’t the “same animal”, a good example of how lack of grounding is a plus can be seen with some types of lightning strikes. Take, for example, a lightning strike on a flying airplane. The strike doesn’t fry the plane’s occupants because the metal shell of the plane is a Faraday box of sorts. Even though the plane, high over the earth, isn’t grounded it will sustain little damage.